One of the first friends I made when we moved to the suburbs, I met when we both volunteered for one of our local museums. Her name is Katie and we spent a lot of time together working on different events. We quickly discovered that we enjoyed many of the same things, in particular cooking. One of the parties the museum held every year was an opening for its annual Christmas Tree exhibit and it was incumbent upon the volunteers to prepare and serve the food for the event. For a couple of years, Katie and I would help plan the menu and supervise the preparation of some of the food. We had lots of fun figuring out what to make and bringing our individual food perspectives into the mix. Remember Chicken Jimmies, Katie? Mexican Cups or Crabbies? We had so much fun. We also co-chaired the museum’s annual Garden Tour twice and I seem to recall we spent more time deliberately what would go in the box lunches than what gardens were on the tour (just kidding). As our nearly two decades of friendship have gone by, we’ve done other cooking adventures together including once holding a cooking demonstration here at my house, mostly with Ina Garten’s foolproof recipes. And when I was working on a cookbook for a local non-profit and needed a handful of talented cooks to do recipe testing, I knew Katie had to be one of them. One of the many things I love about Katie is that she is decisive. You ask Katie a question and she has an answer. She brings this approach to so many aspects of her life and it inspires me because I can be the most indecisive person out there! I also love that Katie always, unfailingly has a smile on her face. Through ups and downs, she is a bright light. Her approach to life also inspires me. Oh, and she makes the best chocolate chip cookies in the world, hands down. In one of my very first posts on the blog, Chicken with Red and Yellow Peppers, I mentioned that my recipes are like old friends. I may not see them all the time, but when I look through my recipe files, it’s like reconnecting with the friends who gave them to me. I so appreciate when people share their recipes and will forever fail to understand why anyone keeps recipes “closely guarded” or “secret”. Thankfully, Katie also subscribes to this notion and she and I have swapped so many recipes over the years, one of which I am sharing with you today. 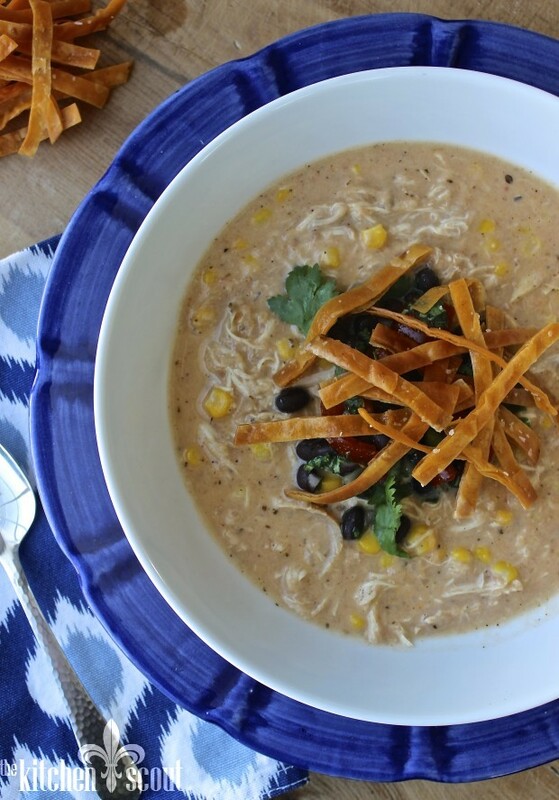 Katie’s Chicken Tortilla Soup is a recipe I have been making for almost a decade. She recently reminded me it originally came from a 2005 issue of Cuisine Magazine that focused on how to use Thanksgiving leftovers. The recipe was originally written using turkey, but Katie swapped out chicken and the rest is history. It is such a great cold weather dish and perfect to serve for football watching which I am sure many of you are planning to do this weekend! The soup is very easy to put together and you can make it even easier by purchasing a rotisserie chicken. 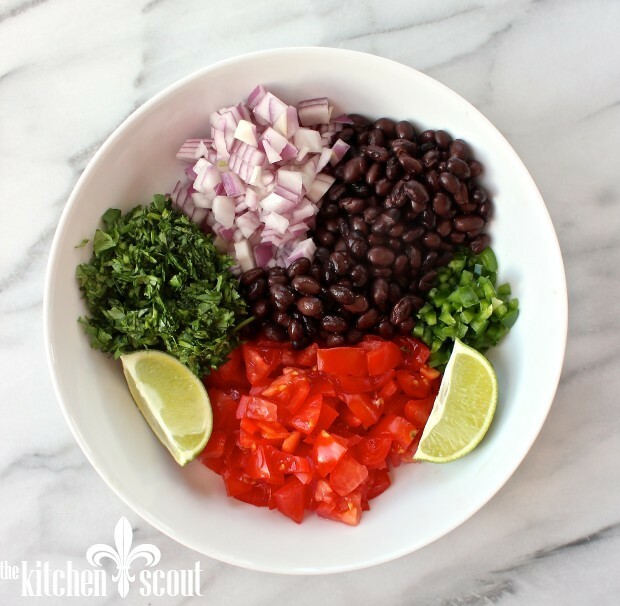 Just make sure to prepare the delicious black bean salsa to serve with it as it provides a nice acidic balance to the velvety soup. Onions, garlic and torn corn tortillas are sauted until softened. Diced tomatoes with green chiles and chicken broth are added together with a mixture of spices including oregano, cumin, coriander and cayenne pepper. As I always say, please make sure your spices are fresh! You really want to be careful if you blend this when it is still hot. I suggest taking the cap off your blender and just covering it loosely with a cloth. Start the blender on the lowest setting. If you blend a hot liquid with the top sealed, it will explode and your soup will end up on the ceiling! Back to the recipe…Shredded chicken is added together with sweet corn kernels and a little bit of heavy cream which I suppose you could leave out, but it’s not that much truly. The soup is warmed through and finished with a cup of Monterey Jack cheese and a squeeze of fresh lime juice. Salt and pepper to taste. 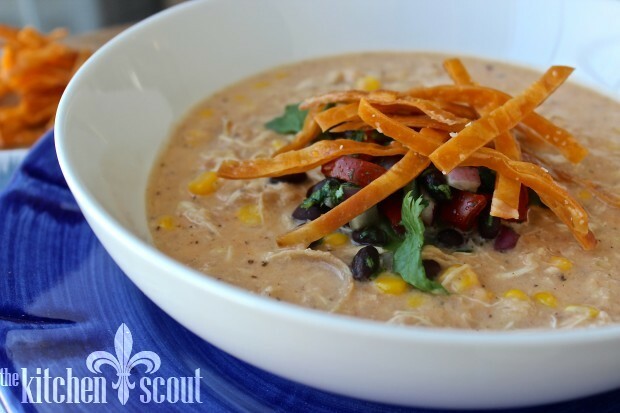 I know Katie and her mom, Diane who reads The Kitchen Scout out in Los Angeles, join me in saying that we hope you make this Chicken Tortilla Soup soon! Please let us know what you think in the comments! 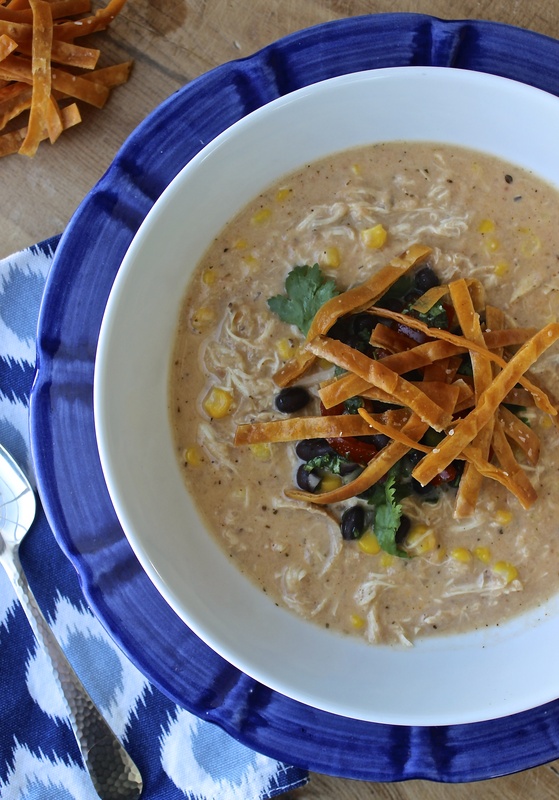 Chicken Tortilla Soup packs all the heat of a traditional chili but is filled with shredded chicken, corn and just a touch of cream for a rich and luxurious dish. Top with the black bean salsa and your favorite accompaniments! Recipe easily doubles or triples. Flavors are even better the next day. See note below for further tips. Heat oil in a large pot over medium heat. Add onion and saute until translucent, about 5 minutes. Add garlic and saute for one minute to release its flavor. Stir in tortilla pieces and saute until soft, another 2-3 minutes. Add tomatoes, broth and spices. Bring to a boil and allow to simmer for a minute or two. 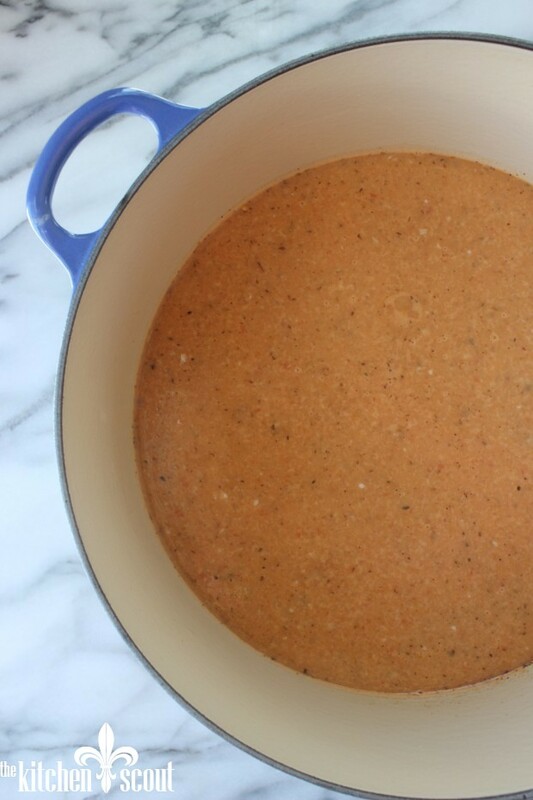 Puree the soup in small batches in a food processor or blender until smooth (caution - if you puree this mixture while it is still hot, you need to vent your machine properly to avoid the soup showering your ceiling). Return puree to pot. Add chicken, corn and cream. 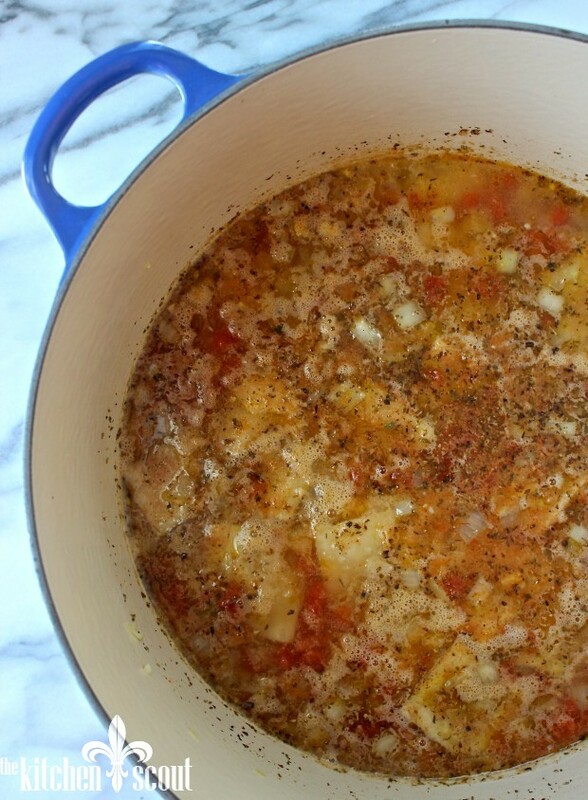 Slowly heat until soup is warmed through. Mix all ingredients and season with salt and pepper to taste. Chill until ready to serve. 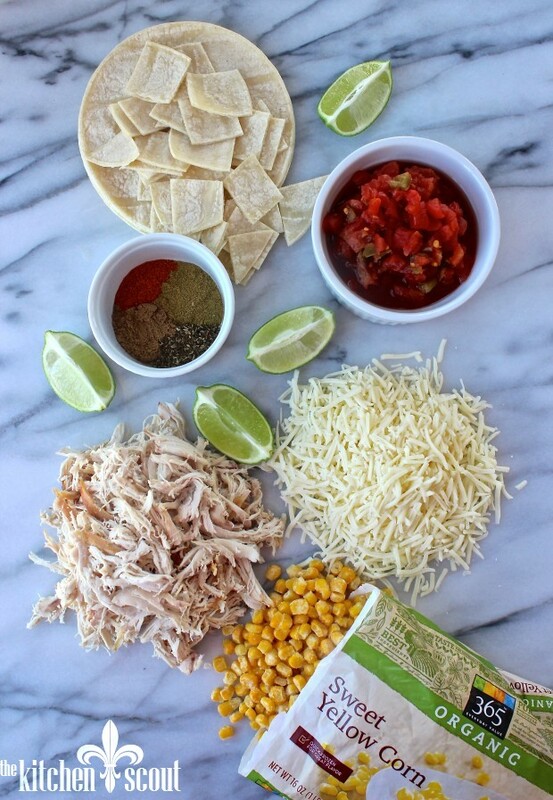 Depending on how thin or thick you like your soup, you can add less or more shredded chicken. At 3 cups, the consistency will be more like a chili where at 2 cups, the dish will present more like a soup. Either way, it will be delish! Yum!! And love Karie’s smile 😊. Now for the cookie recipe! I can’t wait to try this! I like to think of Katie as a little bit of California sunshine right here in Concord. Can’t wait to make this! This is my favorite post ever — I have fond memories of volunteering on your committee and having a great time in the kitchen helping to prep the delicious food you and Katie prepared. Katie is a bright light, and you’re right about her cookies too! Thank you, Susan! We did have a lot of fun didn’t we? Enjoy the soup! Yum Val. I am definitely going to make this for the boys tomorrow. Go Pats! Thanks, Sheila! I hope they like it!